I know, I know, I shoulda said so sooner! But I’ve been so wrapped up in other things, I’ve been slack online. For those of you who caught (or taped) Uncommon Threads (DIY Network) today at 10:30 am Eastern, I was on with Kim and Cecily. Our episode was titled It’s My Party, and we made a spiral bauble garland (Cecily), wine bottle cozy (me), and crocheted flower pins (Kim). 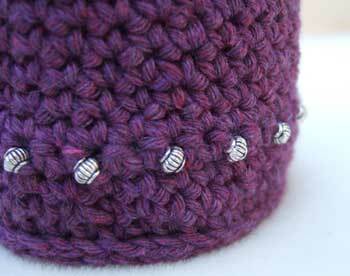 In the final segment, we displayed (but did not demonstrate) crocheted wine glass charms (me) (pattern here! ), crocheted boxes (Cecily), and crocheted sushi (Kim). This was one of several episodes we (a group of designers from Crochet me) taped last July in LA. It was quite an experience and a lot of fun to meet everyone and be there together. 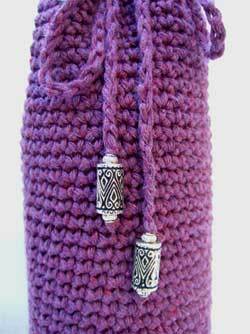 Wine bottle cozy pics below! I thought I had some photos of Kim’s flowers to share, but I have to retake them (yes, I have in my possession two of the flowers that were actually on the show… very cool!). Reds and oranges are so difficult to photograph well! Very cool new digs! Glad to see you back! Congrats on the show and love the cozy! I saw the episode and really enjoyed it. I loved all the projects and plan on making the garland in white & silver for the tree at my yarn shop. We are decorating it with knit & crochet ornaments. It was serendipity that I was able to see Uncommon Threads that day…thanks for great projects. A pal who was supposed to tape it for me messed it up so I haven’t seen it. If you know anyone with a copy pleeeeeeeease let me know. How did you feel about seeing yourself in teeveeland? How are you and your baby going along?